If you’re older than 21, you probably don’t need a mixology app. And that’s because, for the most part, mixology apps are undercooked and just spew giant numbers of crazy vague drink recipes at you like barkers shouting drink specials on Bourbon Street. 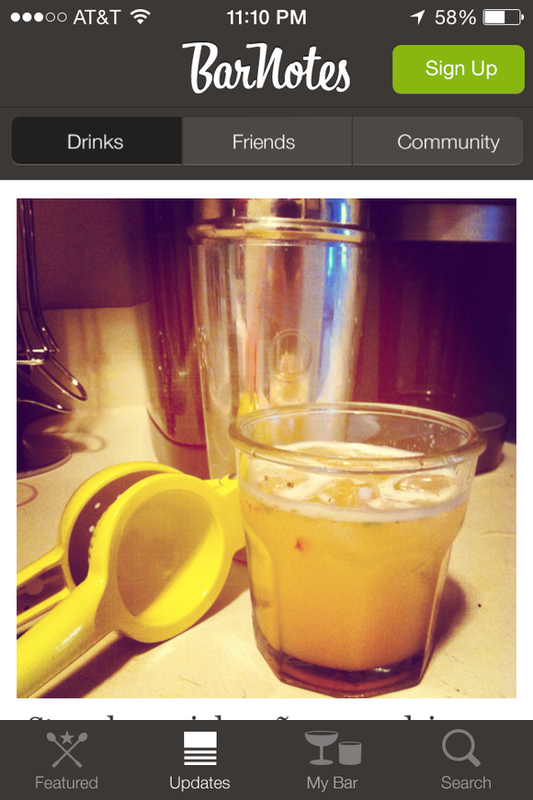 There are multiple apps touting over 8500 drink recipes—are you seriously kidding me with that? In my entire cocktail-loving life I don’t think I’ve consumed 8500 drinks. What are you going to do with 8500 drink recipes?! You’re not a bartender in some kind of Guinness World Records contest; you’re just a thirsty dude. Since it’s better to do a few things well than a zillion things half-handedly, we went on the hunt for mixology-related apps that offered more than just recipes—and found more than a few that offer something more unique than 400 different things to do with grenadine. 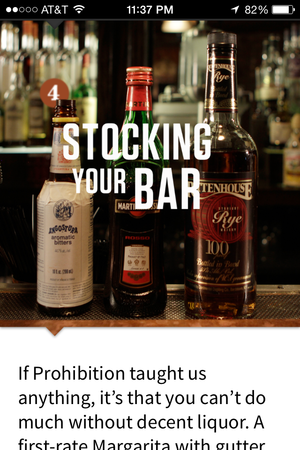 Store the ingredients you already have, and Liquor Cabinet will suggest a drink for you. What kind of motley assortment of liquors and spirits do you have hanging around? Some flavored vodka, a minibar-sized bottle of tequila, a bit of whiskey, and half a bottle of scotch? Sure, we can work with that—just enter them into Liquor Cabinet ($1, iOS; Check out Cocktail Flow or Cocktails Made Easy for Android), add any mixers or garnishes you might also have and then let the app spit out what concoctions you can make with what you have on hand. But wait—there’s more! Liquor Cabinet will also tell you what kind of cocktails you can make if you only had one more ingredient, be it cherries, or seltzer, or any number of a long list of additional items. While that functionality alone is worth the dollar download fee, it also has a handy re-stocking tab to show you at a glance what you’re out of. There’s also a lists section that profiles cocktail recipes by theme (like drinks for brunch or cocktails by the pool), and a helpful “browse drinks” tab that lets you search recipes by category (classics, exotics, frozen drinks, etc. ), or by liquor, mixer, or garnish. It also organizes all the items you have on-hand into a convenient virtual cabinet, displayed on your home screen. 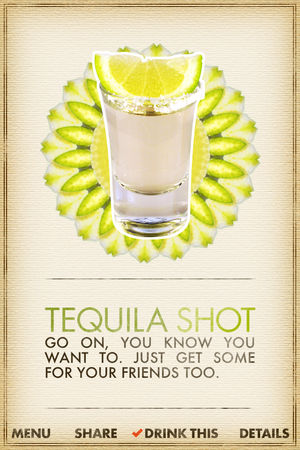 Because every mood needs a tequila shot. Do you feel more like a martini or a tequila shot? Wine or beer? Gin or vodka? Sometimes, it’s hard to make up your mind about what to drink, which is exactly what What Cocktail? ($2, iOS; Thirsty Android users will like the similar app Shake a Cocktail) wants to help you with. Just enter your current mood (pick from joyous, brave, thirsty, tired, considered, or none), then chose your location (either above or below the equator, or Vegas—which removes “time and seasonal sensibilities”), and shake. The app does the rest. First, you’ll see and hear a mixer shaking, then the app will provide you with one of several classic cocktails displayed against a moving, art deco inspired background. This is admittedly a really pretty way to look at drinks on an app; I looked forward to seeing how each drink would be displayed. 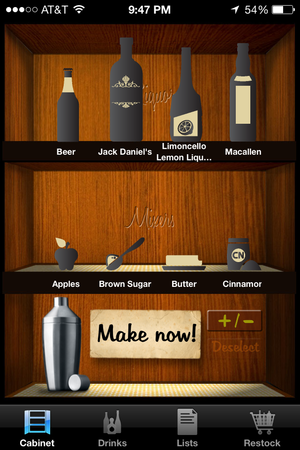 Tapping on the details button will take you to the recipe card that explains how to make the highlighted beverage. You can tap “drink this” on any drink, which adds them to the My Drinks menu available on the home screen, or tap the share button to send the drink via text, email, or Twitter. I wouldn’t mind if there were more moods to choose from on the home screen—like cranky or relaxed—and I also would love to see more drinks added. I’m sure that it takes some time to develop the lovely drink screens, but a bit more variety would really enhance the app. One of the suggestions that pops up is water, however, which is a nice thoughtful touch to hydrate as well as imbibe. The prettiest mixology app of them all is actually an e-book. Calling Speakeasy Cocktails ($10; iOS) an app is a bit misleading—it’s a book, really, organized into a preface and numbered chapters with a title page and everything. But it also has the neat, interactive functionality of an app with embedded how-to videos, images with call-outs that you can tap on for additional information, and digital bookmarks and highlights to quickly mark your favorite places. It’s incredibly easy to get lost in this app, poking around from vodka to Bloody Mary to citrus twist garnishes with just a few taps. It’s actually hard to imagine reading it as though it were a straightforward tome, however, even the introductory chapters on the history of the speakeasy are worth poking around (you’ll find the World Map of Speakeasies and the House Rules for You Home Bar sections here). The following section, a how-to guide, encompasses chapters 2 through 4 with subjects like gear (shaking, straining, glassware), techniques (swizzling, rolling, stirring), and liquors and mixers (stocking your bar). Pulling down on one section automatically takes you to the following section, and pulling toward the top of the section takes you to the previous one, making it easy to scroll through the chapters. The next several chapters tackle the spirits one by one (whiskey, brandy, gin, and et.al. ), and include a section on “master drinks” (like the Highball and the Old Fashioned) as well as a section on seasonal drinks (like a Pimm’s Cup). The final chapters, 16 and 17, include a buying guide and acknowledgements (notable for the contributing expert bartender’s list). 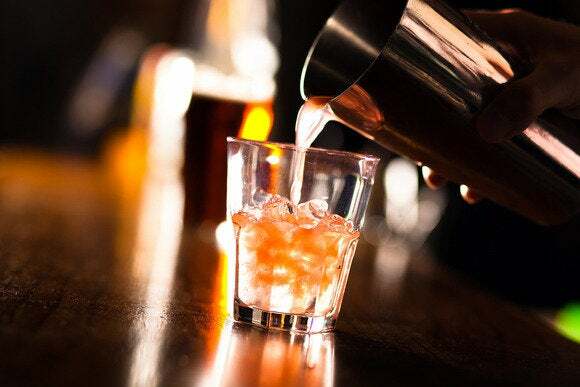 Formula gives you step-by-step bartending instructions straight from the pros, so you can impress everyone with your skills at your next party. Not down with the $10 fee for Speakeasy Cocktails? Instead, try Formula (free; iOS and Android), an app that teaches you how to serve beer, spirits, and coffee like a real bartender. With information on beer styles, videos on how to pour the perfect beer, and details on types of coffee and whiskey, you can educate yourself about all kinds of beverages. Tapping on a spirit provides you details about it. For example, the listing on vodka explains its history, what it can be made out of, and gives the flavor profiles of vodkas from different regions. 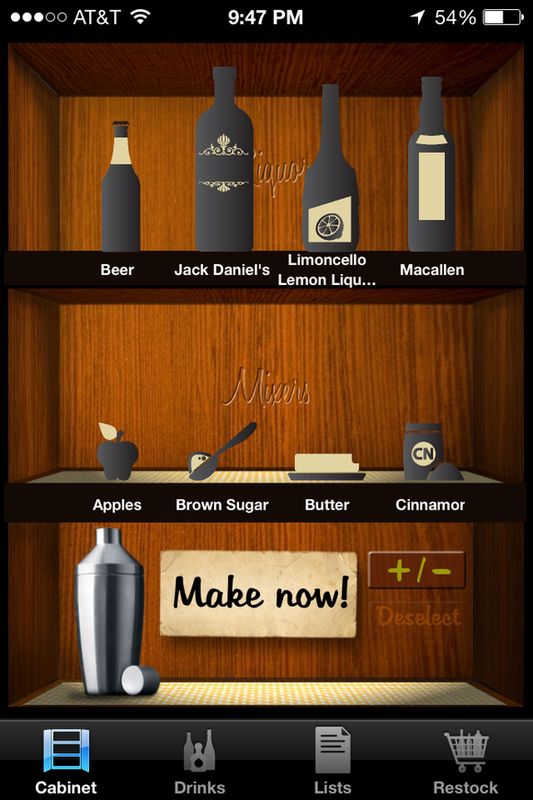 Tapping on the drink icon takes you to an extensive directory of drinks that can be searched by base, name, or method; tapping on the lemon icon once in a recipe screen displays the ingredients needed for that recipe. 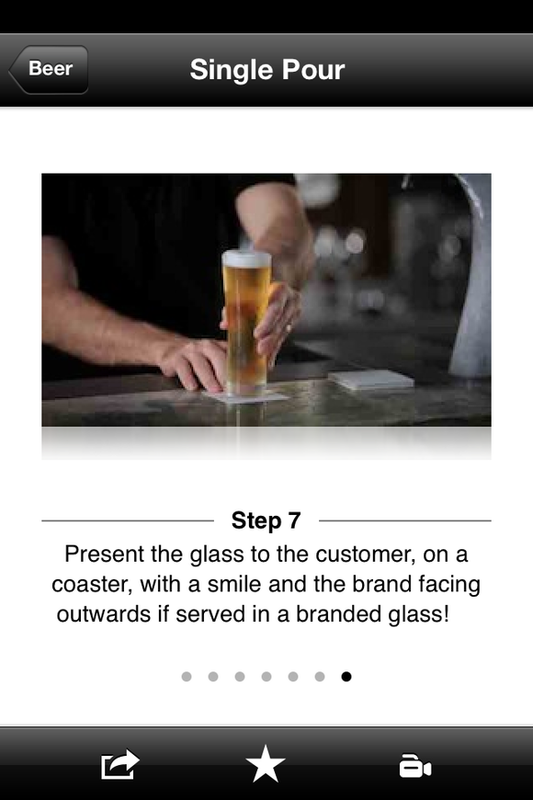 The recipes themselves show a step-by-step instruction guide on how to prepare the drink; many also have videos. The rest of the app—much of the sections on cleaning and caring for equipment and on workplace safety—is a bit more insider than most people will need, although I suppose bar staff-in-training may find it helpful. Prost! Cheers! L'Chaim! Slainte! Salut! If the commonly accepted “everyone is terrified of public speaking” rule is true, then a good portion of you out there probably really dread giving a toast­—particularly if you are trying to do a tremendous job congratulating your significant other’s parent on a new job, or impressing a boss with a toast that helps build team unity. The kind folks over at Tullamore Dew have gathered up a nice variety of toasts for common occasions and put them together in a handy app so you can have a great toast at a moment’s notice. 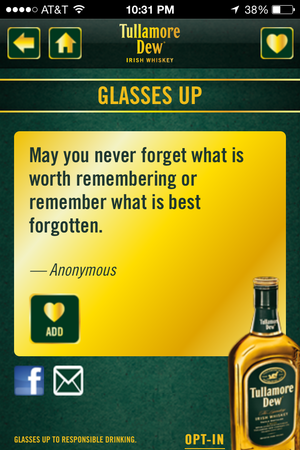 After all, no one can toast like the Irish, and Glasses Up (free, iOS; Drinking Cheers and Toasts is a great Android alternative) has a goodly variety of quick and easy or customized toasts from both known and unknown sources. The app also provides little bits of information on the bottom of the menu, in the Did You Know? box. Hitting the Toast button displayed on the home page takes you to a menu where you can choose from tailored, quick, or random toasts. Quick toast allows you to select from several occasions, including wedding, graduation, or birthday; random toast does all the work for you. Tailored toast, the most involved of the three options, gives you menus to select the theme (celebration, memories), disposition (humorous, serious), and company (friend, foe, kin) to filter through and find you a moment-appropriate toast. 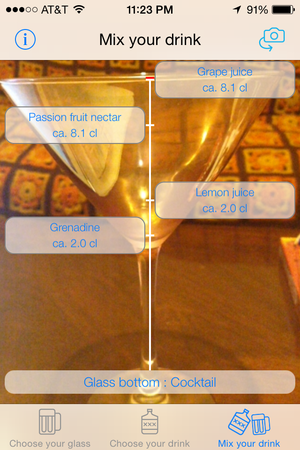 Drink Mixer can tell you the measurements for any drink in any glass. Imagine this: You really want a Cuba Libre, but the only clean glass you have is an oddly shaped margarita glass which makes the measuring a bit tricky. Now, imagine this solution! You just open up DrinkMixer ($2, iOS; Android users should try Perfect Drink instead), tap a few times, and hold your phone’s camera up to the glass as though you were taking a picture. Now, displayed on your phone are marker lines showing exactly how to mix the drink you want in the glass you have. 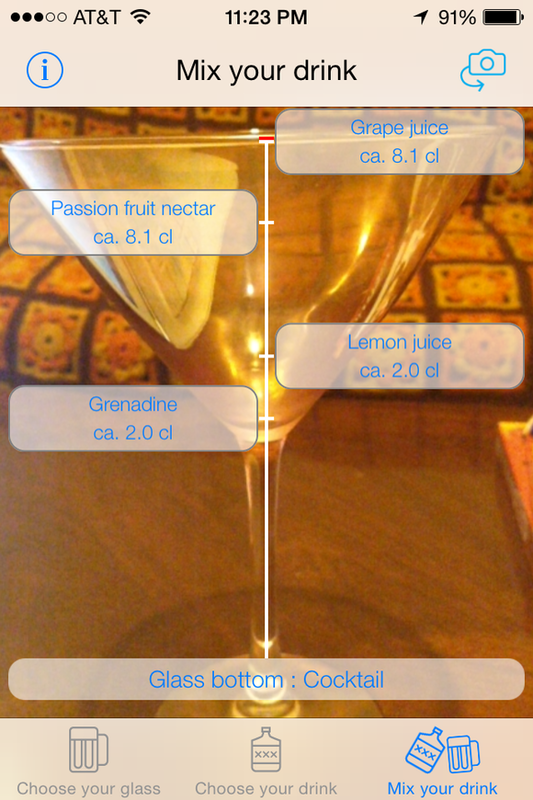 DrinkMixer makes this aforementioned scenario come true: It uses your phone’s camera and your glass of choice to measure out ingredients for just about any drink you want Which is pretty freakin’ neat, right? Right…if you’re in Germany. Which is where I’m assuming the app-maker is based, since every mentioned review link ends in .de and the app seems based on the metric system. Unfamiliar characters aside, it still largely works—I was able to select a glass based on shape alone, and enter in my own drink recipe, then line it up so that I could have easily measured out a balanced screwdriver into my martini glass. However, this one is probably largely of more use to European users since some of the ingredients, drinks, and glassware won’t be easily found stateside. For example, one ingredient is “Waldmeistersirup,” which Google tells me is a German woodruff syrup. That’s… gonna be hard to approximate. At least it’s easy enough to add your own drinks and glasses, which means if you’re willing to set aside some time to customize it, it could prove to be extremely useful on the fly. With BarNotes, you'll never drink alone. If drinking is social, shouldn’t your drinking app be, too? 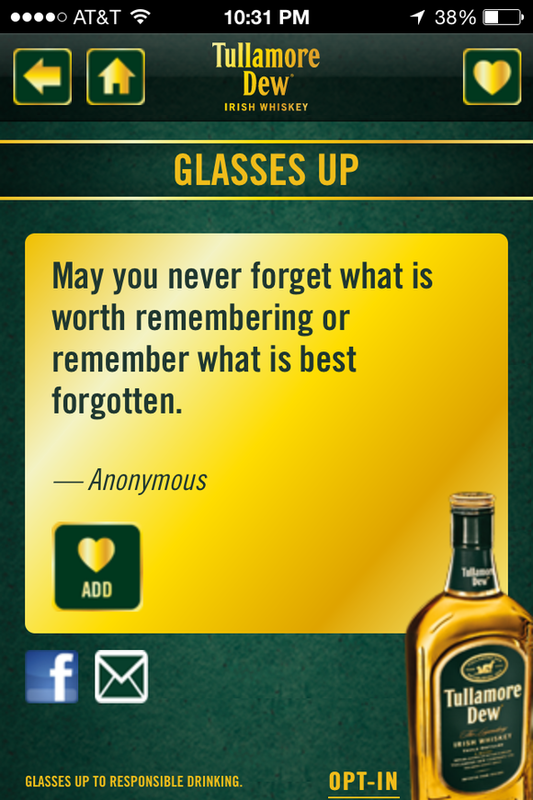 Such is the reasoning of BarNotes (free; iOS), a place to make and share the cocktails you consume and create. Think of it as social media for your happy hour: Find and save recipes, see Instagram style updates, and check out featured recipes curated by the BarNotes staff. A way for aficionados to curate a collection of favorite recipes and share their own formulas, BarNotes is neatly designed around featured recipes, updates from members, My Bar (for logging your favorites), and a search option. Featured links are well populated with timely recipes (like “Who needs limes? Explores lime-less tequila recipes”), but it isn’t a very extensive section. The updates tab is broken down into three sections: Drinks, friends, and community. Drinks features Instagram-style images of user’s drink creations. Clicking on an image here leads you directly to the recipe, which can be saved. The “friends” section lists your contacts and friends within the app, natch. The last tab, community, has a social media feed of users activity. Saved recipes show up in the My Bar tab, you can also tap New Drink here (or from the featured tab) to enter in your own recipe complete with name, notes, a photo, ingredients, and preparation details. 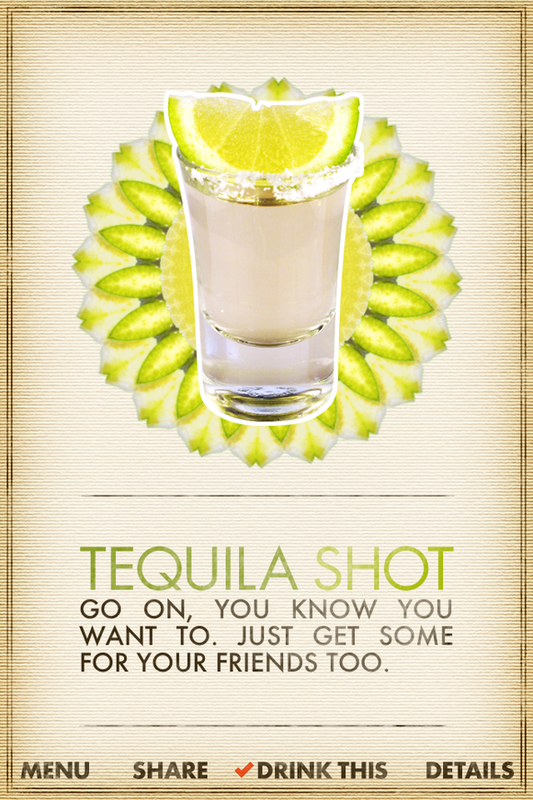 Recipes can be shared via Facebook or Twitter, if you want more of your friends to see what you’re been drinking. Overall, it’s easy to navigate, nice to look at, and has some interesting recipes—it’s surely not the worst thing that’s happened when mixing spirits and social media. So: You want to hit up happy hour with your coworkers, but you’re also training for a marathon. 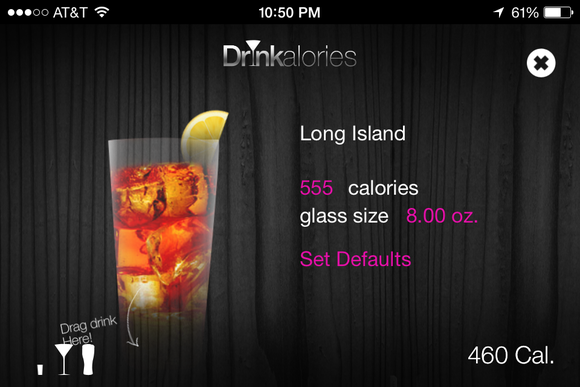 Sure, we can work with that—in the form of Drinkalories ($1, iOS; Android users should check out Alcohol Calorie Counter), an app with a name that makes you want to have a drink. For calorie counters, Drinkalories can help you stay within your goals. Silly name aside, Drinkalories is actually a lovely app, organized in landscape orientation with drinks displayed on a virtual rotating bar table. Tapping and swiping tours you through the drinks; tapping and dragging a drink towards you adds it—and its calories—to your overall count (which appear along the bottom left and right corners, respectively). This makes it particularly useful for tracking how many drinks you’ve consumed (four martinis already?! ), but seeing the calorie count as well really makes an impression. Tapping on a drink, instead of dragging, displays the default size and calorie count for your drink—any text in pink can be tapped on and edited, and that’s actually my main gripe with the app. How am I supposed to know how many ounces are in my glass size, or how many calories my drink is? I have no idea if Kettle One has more calories than Stoli in my lemon drop, or even what size the glass is. Can I guesstimate ounces and glass size? I guess, but then what’s the point of having an app that does it for me? However, I suppose if you’re willing to go through the effort of counting calories in the first place, researching the average ounce size and calories per drink might not be out of the question. But if older apps like DrinkFit can gather this info, it should be easy enough to include here, too. At the very least, leaving everything at a default gives you a ballpark idea on your calorie count, which is a start. This story, "Much more than mixology apps" was originally published by TechHive.